So you have been conditioning your dog, and say it has been going great. At this point, the fundamentals should be well ingrained in your dog. It is better to take some extra time to ensure that your dog has the basics down before you move onto advanced training. You should have “sit” and “down” commands, leash control, voice tones, and his/her behavior in check. If your dog has developed any bad habits, now is the time for some corrective training. Corrective training is simple. Recreate the situation that occurred and apply a corrective action. Let’s say that your dog took food off of your table when you left the room. Place some food on the table (make it easy for him to get, and something you think he wants), and walk him by that food. When he makes the decision to go for the food, apply your correction. In most cases, this would be a correction on the leash, or a strong correction command using good voice tones. Repeat this process until he understands that this is not allowed. I decided that I wanted to begin introducing my dog, Loki, to the scents that I eventually want him to hunt (grouse, pheasant, quail, and duck). 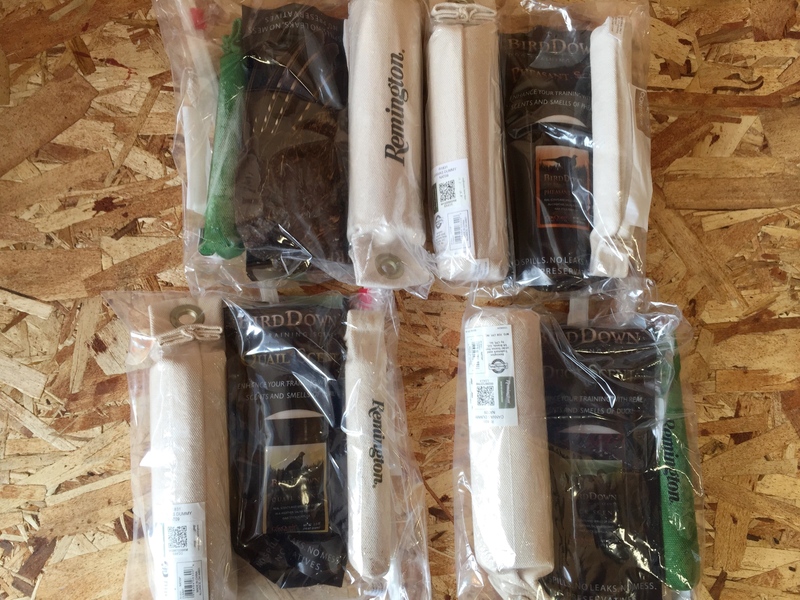 I purchased some small and medium Remington retrieving dummies. I also purchased the scents that I wanted in the form of a deodorant stick. The scents also come in a liquid, but I prefer the application of a waxy stick; I find it less messy. If you or your buddies are actively hunting any of these birds, ask them to save the wings, tail feathers, or an entire bird for you. Each scent/odor is kept separate. I have one dummy with all four scents on it. If you remember in my previous article, I talked about using the 4-in-1 methodology for introducing scents to Loki. I have one dummy that I placed all four scents on. This is the initial dummy that I will use to introduce scents to Loki. As he becomes conditioned, I will introduce the other four dummies that each have their own scent. In doing this, Loki will be learning to look for any one of the four scents that I want him to find. They can be together, or they can alone. A simple way to initiate this is to use a hallway, or a section of your yard, that can act as a corridor. It is important that the area you use limits his ability to get away from you. Simply place a scented dummy at the end of the hall and bring him to it. Let him discover it, and as soon as he does praise him. Allow him to bring it to you, and praise him again when he does. Grab the dummy and give your drop command (if he doesn’t naturally drop it, gently wrap his upper lips over his teeth, repeat the command, and apply gentle pressure). Once he drops it, praise him again. Next, throw the dummy back down the hallway (this should be no more than five feet at the start) and repeat. Make sure to keep it fast and fun. Remember to stop while he is still interested. You always want to end on a high note, and he should be left wanting more. If you do this to the point he isn’t interested, then you have gone on too long. Quick tip: If you get wings or tail feathers, prepare a large shoebox by spreading Borax (or a similar product) about an inch thick on the bottom. Then, sprinkle some Borax onto areas that have any meat left on them (remove as much meat from the wings as you can). The Borax will basically dry up any meat that is left. Place the wings/tail feathers in the box and leave them for a couple of months. If you get an entire bird, place it in a freezer until you need it for training. 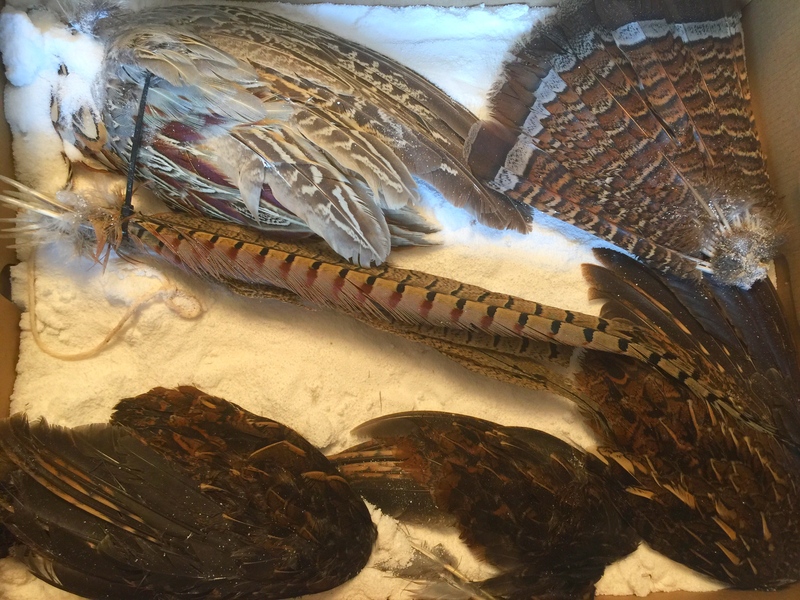 Pheasant (upper left) and grouse are placed inside a box lined with Borax. I’m sure you remember the first time you heard a rifle or shotgun fire. The sound was intense, and it may have scared you. That experience will be no different for your dog. The last thing we want is to end up with a gun-shy dog. To prevent this, follow the same process as all other conditioning: a slow, planned introduction. I started with a toy cap gun. Find something that your dog loves, such as eating, and when he is doing it, simply fire your cap gun once. Repeat this process during different meals, and on different days. If he shows no concern, then you can move on to a starter pistol. I suggest doing this one outside. Also, don’t forget to tell your neighbors what you are doing so you don’t get a visit from the police. Again, while he is eating, simply fire the starter pistol once. If he seems indifferent about the noise, try firing it while doing a different activity, such as playing in the yard. After doing this for a week or two, without Loki showing any concern, I took him out into the woods with my .22 lever-action rifle. I let him lead me down a trail, and when he was completely distracted, I fired the .22. He didn’t care. We will continue this for a while before we move onto the shotgun. Another good indication of your dog’s readiness for gun conditioning is how he reacts to random loud noises. The 4th of July, turning on the lawn mower, or firing up loud power tools are all great indicators to see if he is ready to start. If he is skittish during these, then you aren’t ready. Don’t force gun conditioning; wait for your dog to become ready. You can overcome a gun-shy dog, but it is better to prevent it from happening in the first place. Loki and I have been doing well with leash training. 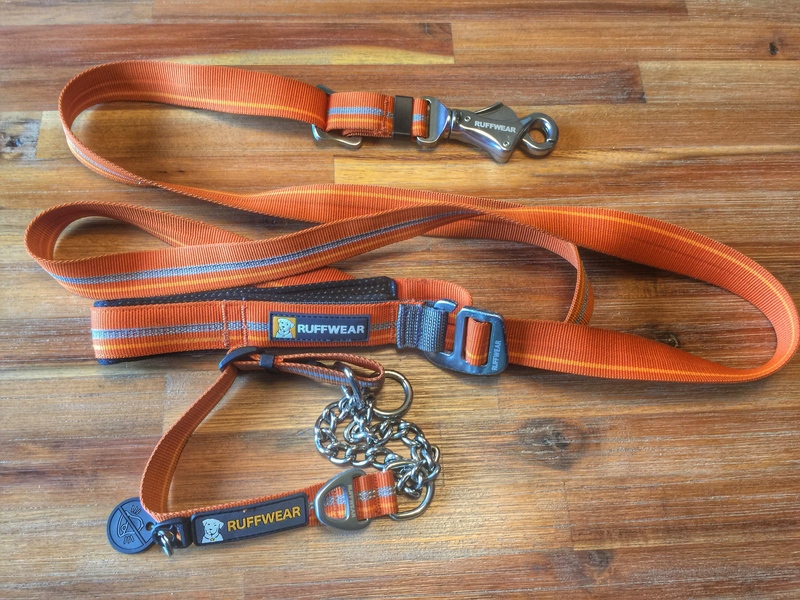 I have been using Ruffwear’s Chain Reaction collar and Slackline leash (check out our detailed look at both). Using the training principles that I have outlined in previous articles, Loki has made great progress. However, he has learned that I cannot readily enforce a command if he is off-leash, and so I have decided to introduce an electronic collar. I purchased the Wetland 425 made by Sportdog. I was able to get an incredible deal by using Promotive (for more information on getting pro deals, click here). 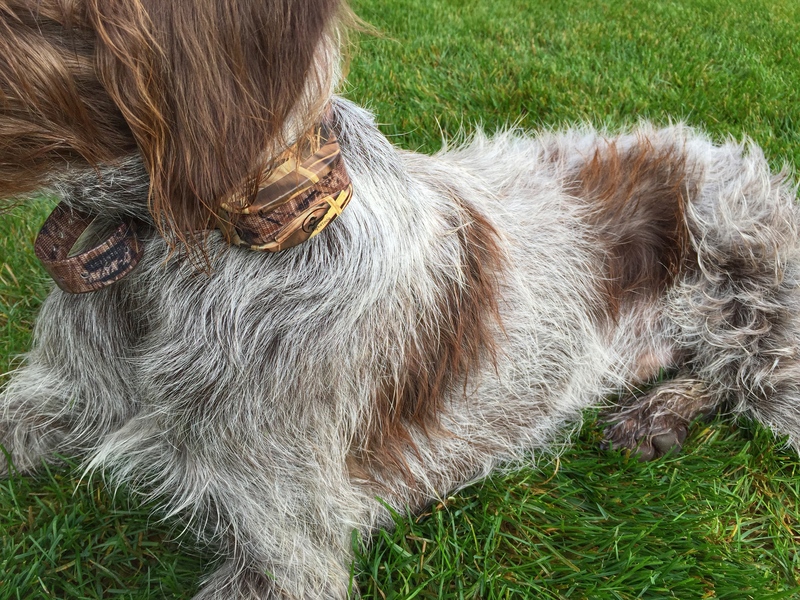 This is an electronic collar designed for hunting dogs. It has tone, vibration, and stimulation options (up to 16 levels). It has a 500-yard range, expandable up to three dogs, and is waterproof up to 25 feet. When the collar arrived, the first thing I did was test the various levels on my arm. In law enforcement, you have to be sprayed with OC (pepper spray) before you can use it on others. It is important to realize the pain that you can inflict so that you can more appropriately apply it. It should only be used in conjunction with proper training, and never as an arbitrary punishment device. Every time I put this collar on Loki, I give him a treat. I wanted him to associate it with something good, and this helps with that transition. This collar has three distinct modes: audible, prick (allows stimulation for a short moment), and continuous (stimulation continues until you let go of the button). This is a great feature because it allows you to scale up or down on the correction method. When we first started using the collar, I would press the audible button as I made a correction on the leash. We repeated this for some time before I moved on. Next, when I made the correction, I pressed the prick button. He eventually became conditioned to the process. Now I am able to make corrections without also making a leash correction. If he exhibits a behavior that I need to correct, I press the audible button, and typically this is enough for him to stop that behavior. If there is something, such as another dog, that has him so distracted that he doesn’t notice the sound, then I move onto the prick and the behavior stops. This has allowed me to start giving commands absent the leash, because I can enforce my commands from a distance. Loki wearing Sportdog’s Wetland 425. You should be able to slide two fingers under the collar at all times. I know that some people are against electronic collars. As long as these tools are used correctly, and in conjunction with proper training, they can be a great asset. Having conditioned Loki to the sound, the collar acts as more of a deterrent than it does as an active disciplinary measure. If you are in the market for an electronic collar, I would suggest that you look for one that has this audible feature. Next week, I plan on taking Loki grouse hunting. It is important to remember that he is still young and that I shouldn’t place any unrealistic expectations on him. If you are taking your dog out for the first time, don’t expect him to be perfect. Instead, treat the trip as a chance for both of you to get experience working together. It is also a great idea to outfit him in something that makes him easier to see. I recently acquired a high-visibility vest from Ruffwear for Loki that I look forward to testing out.